Weta, 2012. 10"/25 cm high. 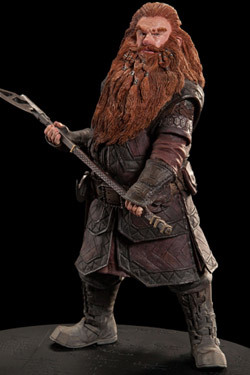 A proud and noble Dwarf of resolute character and stern bearing, Thorin Oakenshield™ is the grandson of Thror of the line of Durin and heir to lost throne of Erebor. Alongside Moria, Erebor stood as the greatest of the realms of the Dwarves, a vast kingdom carved from the living rock of The Lonely Mountain, bustling with trade and bursting with wealth. Down upon Erebor the great dragon Smaug™ had fallen and the city and its people were engulfed by the inferno of his coming. 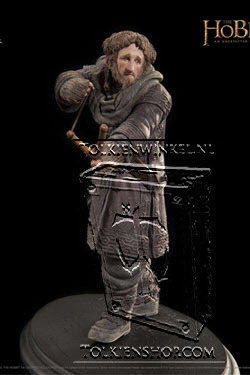 Thorin Oakenshield and his kin were fortunate to escape with their lives, though they left everything else behind. Their treasure and pride was swept up by the dragon into a pile upon which he curled to sleep, deep inside the mountain. Thorin Oakenshield was sculpted by Scott Spencer. Sculpted and created by the same artists and craftspeople who work on our movies, Thorin Oakenshield™ is one of the first three statues in our range of 1/6 scale chracters from The Hobbit: An Unexpected Journey. 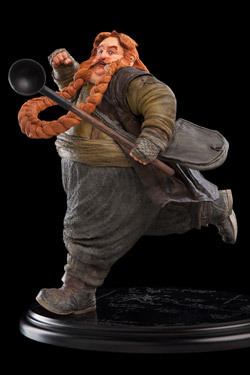 Weta, 2012. 13.4"/34 cm high. 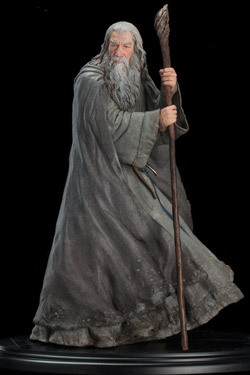 Wandering Middle-earth’s winding paths is the travelling conjurer Gandalf, known by many names to many peoples in many lands, though few could guess the true extent of his powers or purpose. 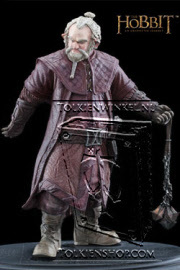 His fireworks may delight many a Hobbit youngster, but the Grey Wizard is no mere magician or trickster. 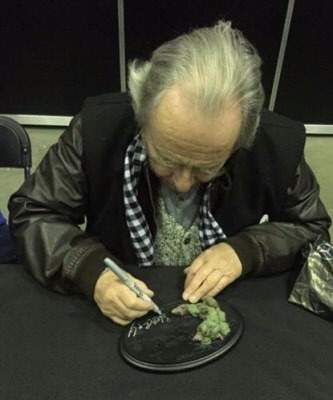 Gandalf is old beyond reckoning and wise the reach of mortal men. Where Middle-earth’s lords and kings brood over the fortunes of their realms, Gandalf’s gaze is cast across a wider canvas and it is the greater good of all the world’s free peoples that he is concerned with. Needless are none of the acts of the Wizard, so when he councils Dwarf king in exile Thorin Oakenshield to enlist the services of Mister Bilbo Baggins as a burglar in his quest to reclaim his birthright from the dragon Smaug, it is done with a keen insight into the sheltered Hobbit’s qualities and an understanding of how crucial these will be to their success. 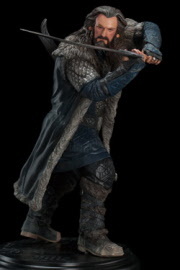 The Hobbit impresses Thorin Oakenshield little upon their first meeting, but, despite his misgivings, the Dwarf knows enough of Gandalf to credit him with good reasoning, and indeed it will not be long before Bilbo Baggins’s mettle is tested and the Wizard’s wisdom proven. 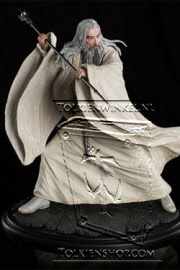 Sculpted and created by the same artists and craftspeople who work on our movies, Gandalf the Grey is one of the first three statues in our range of 1/6 scale chracters from The Hobbit: An Unexpected Journey. 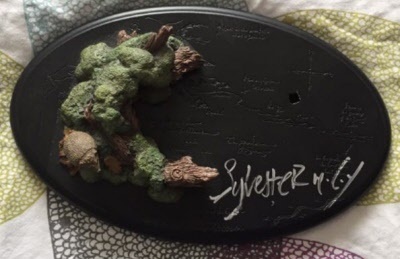 Signed by Sylvester McCoy on the base. While Gandalf™ the Grey and Saruman™ the White busy themselves with the affairs of Elves, Men and the speaking peoples of Middle-earth, the smaller folk of fur and feathers are the concern of the Brown Wizard, Radagast™. 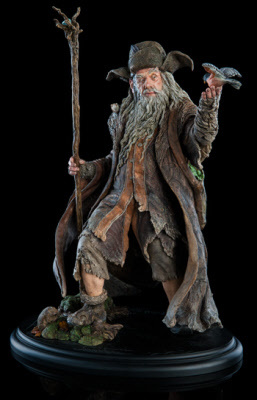 Outwardly Radagast the Brown is a gentle hermit, soft in character and mind, often absent-minded and fumbling, with tattered robes and mismatched footwear; his raiment home to a bewildering menagerie of miniature beasts and fungi. This façade is an illusion so complete even the Wizard himself is sometimes fooled, but in truth great power resides with him, as it does in each of the five Istari, and he is ever watchful for the return of the enemy against whom he was sent from the West centuries ago. 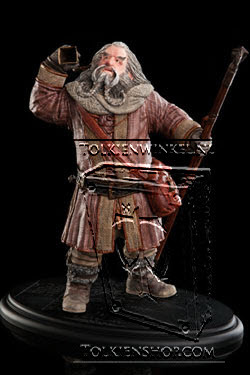 Having made his home at Rhosgobel near the borders of what was once Greenwood the Great, Radagast tends to the needs of the animals that live in the darkening forest. 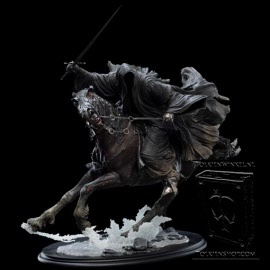 A terrible sickness has infected Middle-earth’s wildest wood, an unnatural blight that the worried Wizard traces to the old fortress of Dol Guldur with the help of his animal friends. 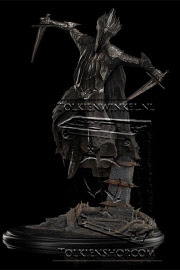 Something ancient and unearthly stirs in the shadows of the ruin. 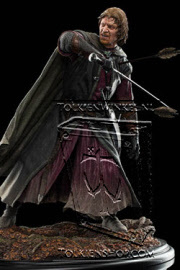 A dark power gathers its strength beneath the choking thorns, a power that will soon put the courage and cunning of Radagast and his fellows to the ultimate test. 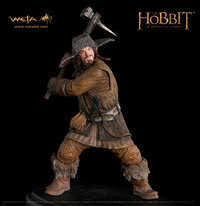 Weta, 2012. 8.1"/20.5 cm high. A quiet life in the sleepy gardens of The Shire was all Bilbo Baggins ever knew that he wanted, but when his home is invaded by thirteen rowdy Dwarves and the Wizard Gandalf, the gentleman Hobbit finds himself enlisted as a burglar on a perilous quest across Middle-earth’s Wilderland to reclaim treasure from a dragon. 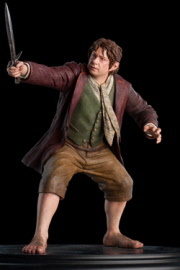 An adventurous spirit is not a quality prized among Hobbit folk, so the formerly respectable Bilbo Baggins’s sudden departure comes as much as a surprise to him as it is to his neighbours. He blames it on the Tookish blood in his veins. That side of the family was always the most odd and taken to unhobbity impulses of curiosity. Bilbo Baggins was sculpted by Brigitte Wuest. 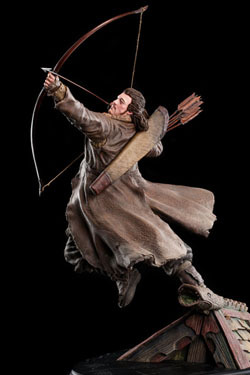 Sculpted and created by the same artists and craftspeople who work on our movies, Bilbo Baggins is one of the first three in our range of 1/6 scale chracters from The Hobbit: An Unexpected Journey. Weta 1728. 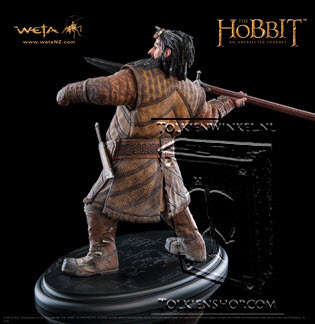 Weta continues the legacy of producing finely crafted, highly detailed 1/6 scale collectible polystone statues from Middle-earth. 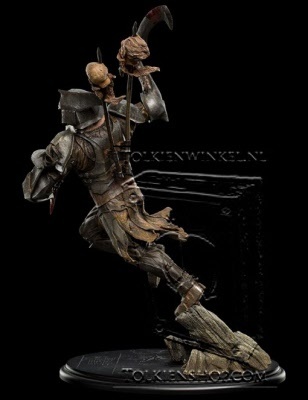 The essence of each character expertly captured in every piece. 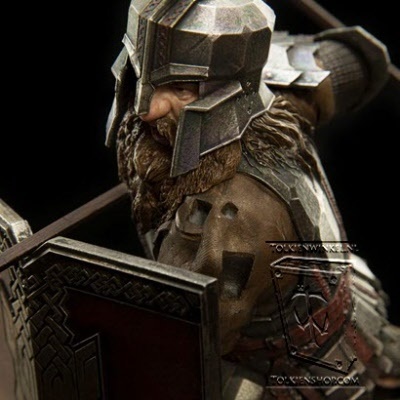 Sculpted and created by the same artists and craftspeople who work on our movies, Dwalin the Dwarf is the fifth sculpture in our range of 1/6 scale characters from ´The Hobbit: An Unexpected Journey´. 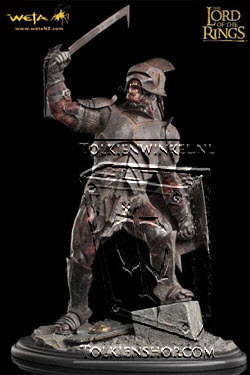 Weta 1318. 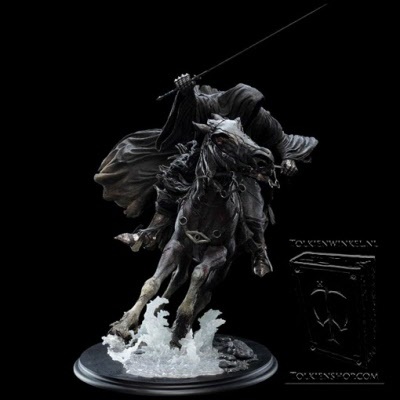 Released in 2015 in a limited edtion of 1000 copies. 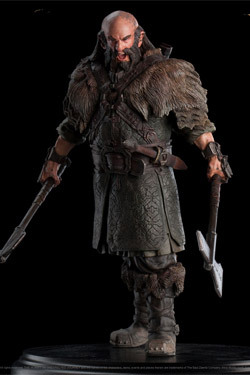 A veteran of the Orc War, Bifur the Dwarf bears the scars of battle, including the remnants of an enemy axe lodged in his skull. 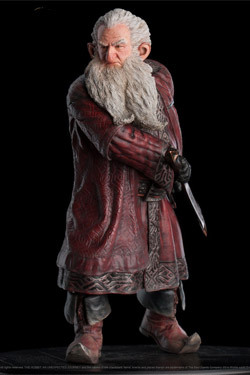 Bifur the Dwarf was sculpted by Lindsey Crummett. 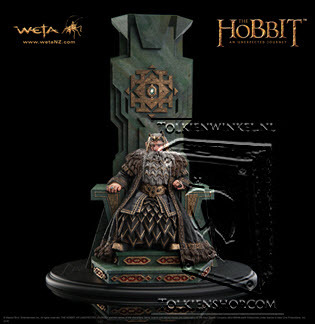 King of the Dwarves under the Mountain and possessor of the greatest treasure hoard in all of Middle-earth, Thror reigns supreme from his throne at the heart of the carved city of Erebor. 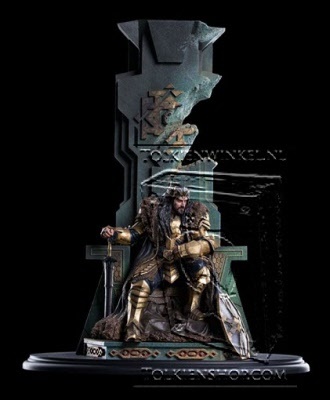 In the king’s treasure halls, innumerable gold coins stamped with his likeness lie stacked thousands deep, yet still Erebor’s living stone walls glitter with criss-crossing veins of unmined wealth: gems, gold and other precious metals. King Thror on Throne was sculpted by Gary Hunt and Dave Tremont. 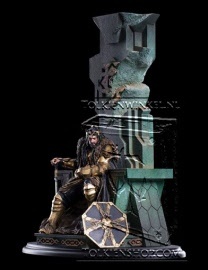 Brought to you in a Limited Edition of just 750, King Thorin on Throne is WETA's latest 1:6 scale statue from The Hobbit. Yet her passage through this lair of the enemy would not go unchallenged. Summoned from their barred tombs, the Nine rose to surround the lone Elf: undead Ringwraiths, greatest servants of the Dark Lord Sauron. No mere mortal thralls, the Nazgul were spirit beings, bound to their Master by the Rings of Power they bore, gifts to them in an age long past, when they were living men. 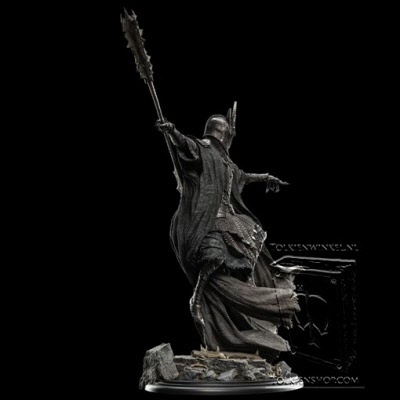 From all corners of Middle-earth they had come, flocking to their Lord on the promises of power, knowledge and riches: from Forod, the north; Harad, the south; from the east; and from the west. 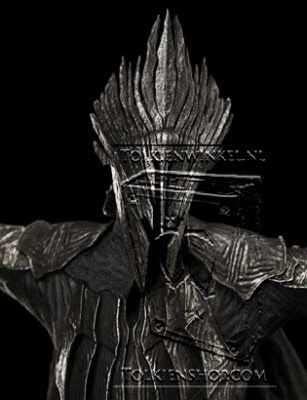 Eagerly they had accepted the Rings proffered them by Sauron, flattered and hungry, and in return they surrendered their eternal souls to the Deceiver. 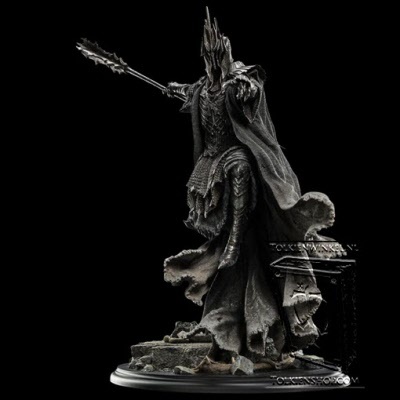 Their bodies long since spent, they gathered in Dol Guldur as grim echoes of their former selves, yet more potent for the irresistible might of their master flowing through them. 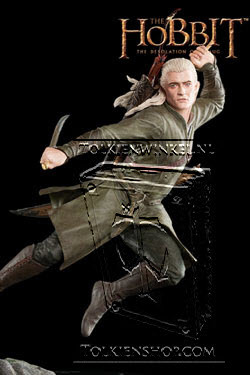 Wielding terror and despair like the savage blades gripped in their mailed hands, they closed upon the White Lady like the folding wings of a great, black bird. In an edition of just 500, The Ringwraith of Forod is Weta Workshop's latest 1:6 scale statue from Dol Guldur; sculpted in monstrous detail by artist Gary Hunt. 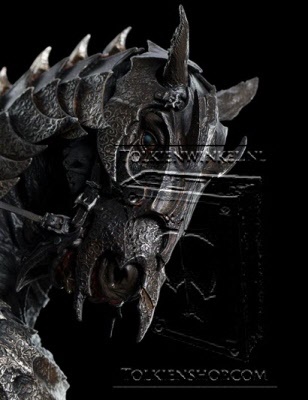 Weta 2019. 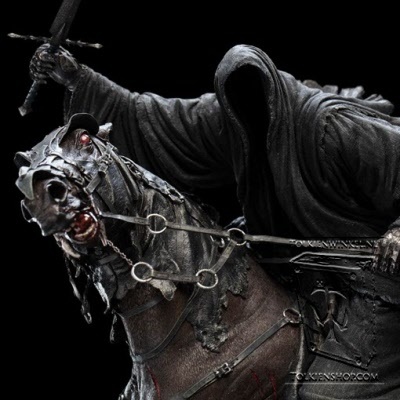 The Nazgûl were the greatest of Sauron's fell servants. Immortal beings enslaved by Rings of Power to serve the will of the Dark Lord, the nine Ringwraiths spread fear and dread wherever they went. Few could withstand their coming, empowered as they were by the spirit of Sauron inhabiting them. Weta 2024. 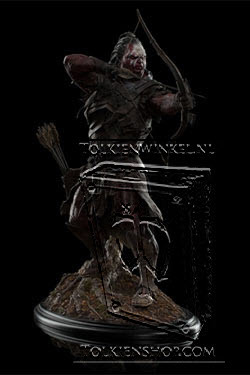 Mustered in darkness and marched to the threshold of Erebor by secret ways, Azog the Defiler's great host spills from the earth to lay siege to the mountain kingdom of the Dwarves and the city of Dale. Bolstered by Trolls, Ogres and Goblin mercenaries, the main body of the army of Dol Guldur is composed of Orc soldiers. 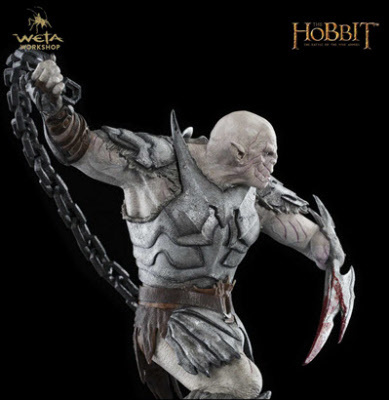 Tall, long-limbed, and broad-shouldered, these are no ordinary, bent-backed, stunted Orcs, but a more disciplined and dangerous breed, like Azog himself. 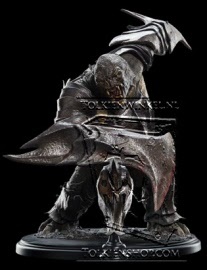 Despite the pain a bright sky inflicts upon their pale, night eyes, the Orc soldiers of Dol Guldur fight on in daylight, driven by the promises of carnage, ruin, and feasts of man-flesh. Falling upon the defenders of the Mountain, their ordered ranks shatter into slavering mobs as the soldiers surrender to their bloodlust. 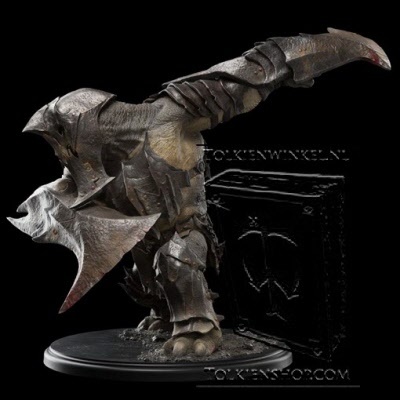 They run through Dale's streets and prowl the battlefield before the Gate of Erebor, roaring with savage delight at the destruction they bring, cruel blades gripped tightly in armoured fists and dripping with blood and gore. 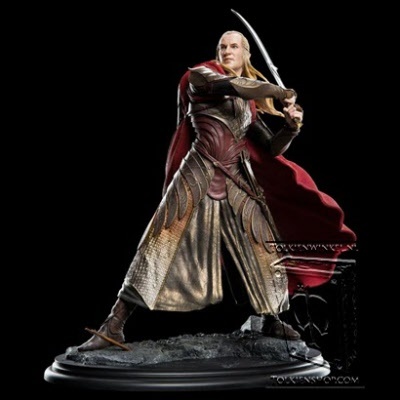 Legolas Greenleaf was sculpted by Weta Workshop sculptor Gary Hunt in the likeness of the character played by Orlando Bloom in The Hobbit: The Desolation of Smaug. From Peter Jackson´s ´Lord of the Rings´ films comes this stunning statue of an Uruk-Hai, ready to attack. 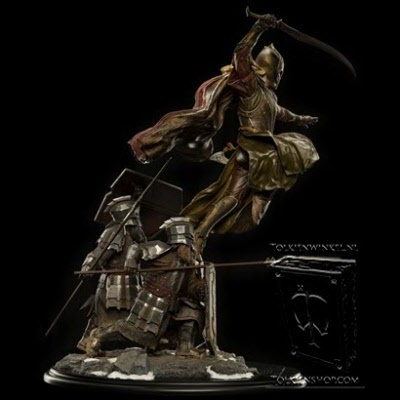 It´s made of high quality polystone and stands 29 cm tall. 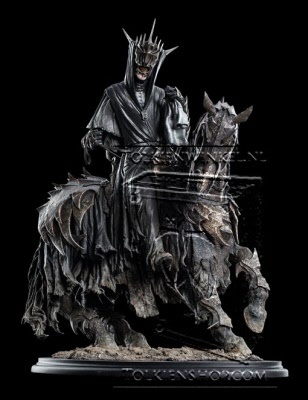 Once a man of noble lineage, the being riding out is now but a puppet of flesh for the Great Eye of Mordor: a shell in human form, his own soul subsumed by the indomitable will of the Dark Lord. 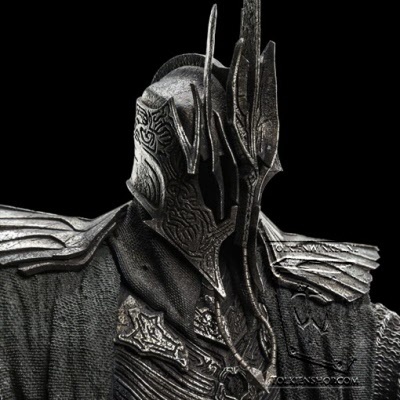 His own name long forgotten, the Lieutenant of Barad-dur is known now as the Mouth of Sauron, a title both fitting and descriptive, for his enlarged maw is riven and blackened by the evil he speaks: a cruel gash in a masked face, devoid of other features. 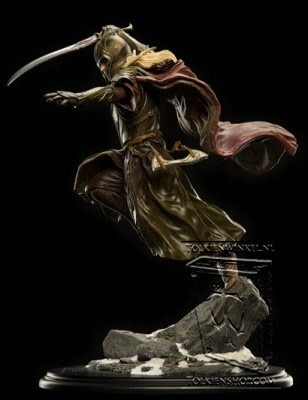 Brandishing the Mithril shirt worn by Frodo, the messenger of Mordor taunts Aragorn and his allies, wielding lies of the hobbit's torture and death like a blade to cut their fragile hope to shreds. 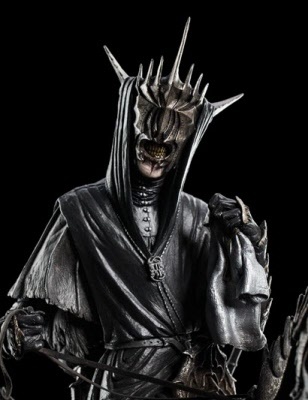 Cut from the initial release, the Mouth of Sauron returned for the Extended Edition of The Lord of the Rings: The Return of the King. 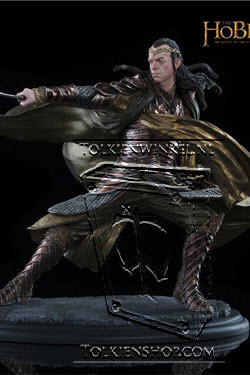 Weta Workshop sculptor Sam Gao was tasked with immortalising the character in a collectible version. 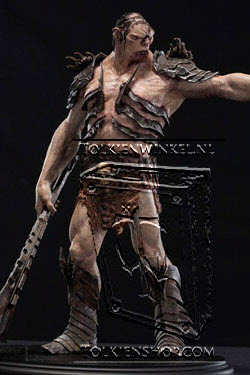 Sculpted from clay, its pose was refined with Weta co-founder Richard Taylor, concept designer Daniel Falconer, and sculptor Daniel Cockersell. 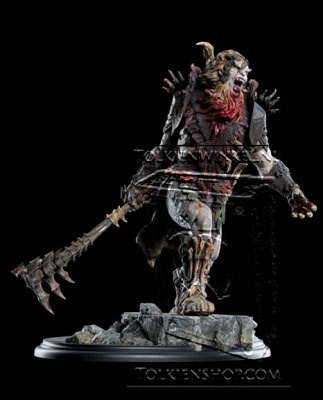 Taken from the original designs by Weta Workshop concept artist Warren Mahy and the 3Foot6 art department, the final statue is as close as you can get to its terrifying on-screen counterpart. 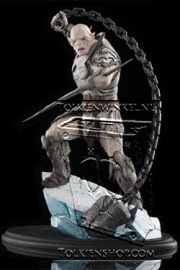 Weta 2119. 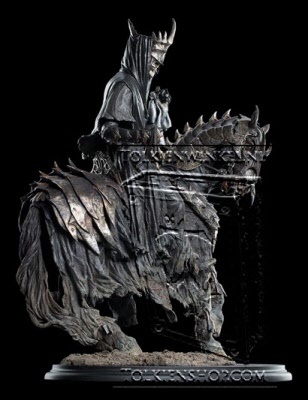 Imprisoned by the Necromancer, Gandalf the Grey finds himself at the mercy of the savage Torturer of Dol Guldur. 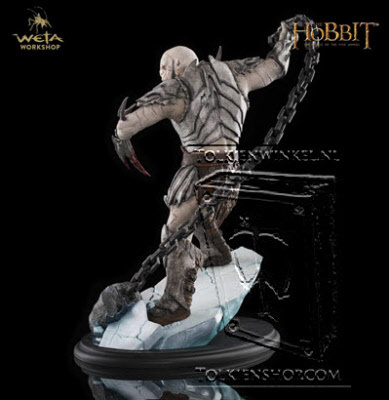 Exhausted and brutalised, the Wizard is dragged from his gibbet by the huge Orc, who makes ready to cut the Elven Ring Narya from his hand. Unusually tall and straight-backed for an Orc, the Torturer has long served the Dark Lord through his servant Azog, leader of the great Orcs of Gundabad. The Torturer fought in Azog's campaign against the Dwarves and partook in the conquering of Moria, where he received a grievous wound. 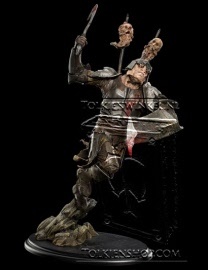 In an edition of just 500, The Torturer of Dol Guldur is Weta Workshop's latest 1:6 scale statue from Dol Guldur; sculpted in monstrous detail by artist Sam Gao. 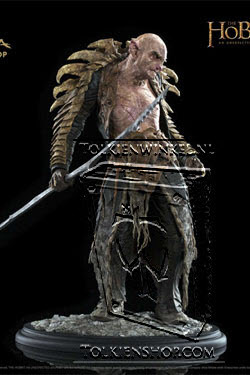 Weta 2117. Although his screen time was comparatively brief, Isildur was nevertheless a pivotal character in The Lord of the Rings trilogy and embodied some of Weta Workshop's finest costume and weapon work. 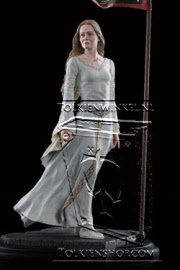 With intricate inlays of brass and elvish writing, Narsil (which ultimately became Andúril) was one such example. 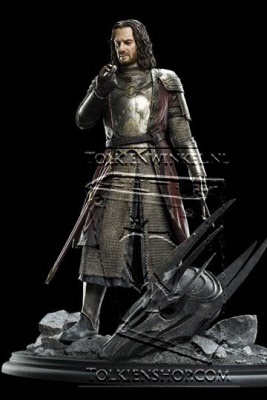 As the blade was to be shattered by the foot of Sauron during the prologue, the sequence required a collection of breakaway swords. These swords, cut into the same exacting seven individual shards, were glued together and broken again and again to capture the moment. 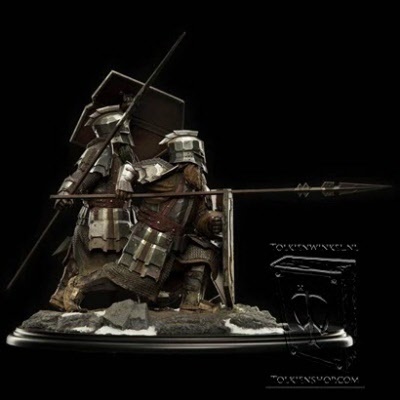 Distilling this complex scene into collectible form, was senior sculptor Daniel Cockersell - no stranger to Middle-earth, having formed part of Weta Workshop's physical sculpting team on The Hobbit. 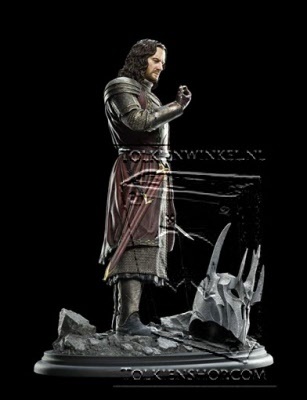 Isildur stands complete in 1:6 scale: gazing at the One Ring, broken hilt of Narsil still clutched in one hand. 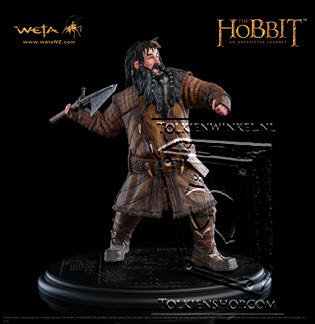 Weta 2638. 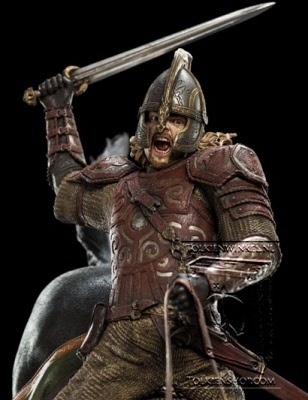 Nephew of ailing King Théoden of Rohan and captain of the Mark, Éomer was as loyal to his liege as the truest Rohirrim, but for questioning the orders of Gríma Wormtongue, the horse lord was banished. 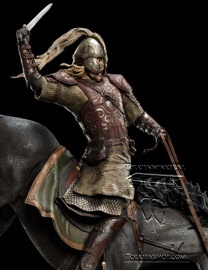 Taking his Éored, he rode from Edoras to make private war upon the Orcs that had invaded their realm, even as Théoden turned a blind eye. In truth the fallen Wizard Saruman had gained influence over Rohan's king by sorcery. Upon the return of Gandalf Théoden was freed of Saruman's grip, but not before much of his country had been usurped or put to flame. As Saruman's legions marched upon them, the Rohirrim fled to the fortress of Helm's Deep to mount a last stand against the Wizard's hordes. Outnumbered and outmatched, the few defenders held as long as they could, but defeat loomed. Then suddenly, as the first rays of sunlight crested the rise to the east, a great host of riders appeared, their spears gleaming in the radiance of the dawn. 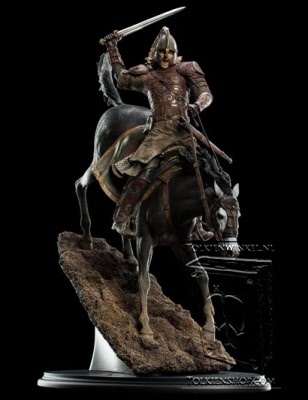 Led by Éomer upon his brave horse Firefoot, the Riders of Rohan streamed headlong down the scree slope, voices united in a mighty yell and swords held aloft. 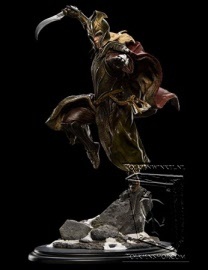 Like the coming of the tide they swept over the army of Isengard, saving their king, his people, and their realm. 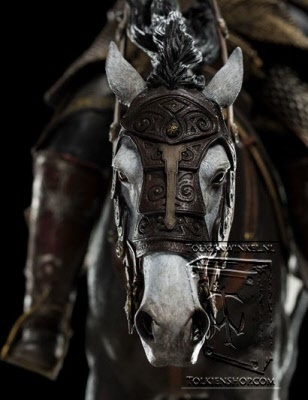 Eomer is the latest addition to Weta Workshop's high-quality 1:6 scale Middle-earth line; a line that is made by the very same artists and technicians who work on our movies. 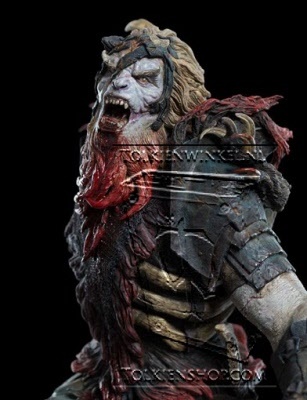 Weta 2113. 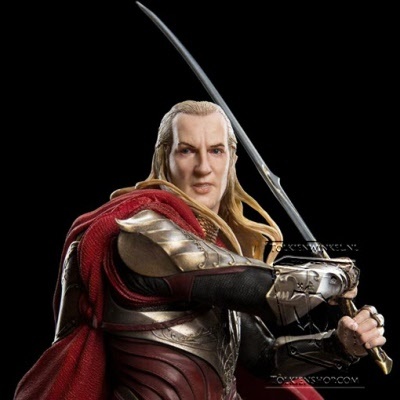 Leading the Galadhrim was the Silvan Elf Haldir, march warden of Lórien and a great warrior, as skilled with sword as he was with bow. 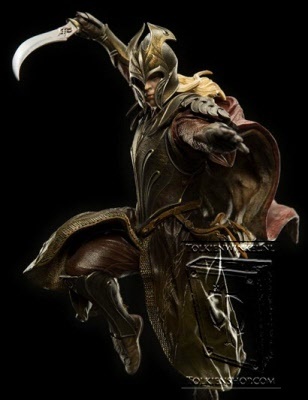 Buying time for the retreating Rohirrim at great cost, Haldir and his courageous Elves defended the Deeping Wall even as Saruman's Uruk-hai breached and swarmed over them. Haldir himself stood upon the top of the wall, resisting an endless river of bloodthirsty Uruks as he covered Aragorn's withdrawal to the Keep, resolute and fearless to the very end. A soldier of Rohan in King Théoden's royal guard, Gamling was sworn to protect the throne, but the loyal warrior's allegiances were tested when Gandalf the White and his companions came to Edoras to seek audience with the king. 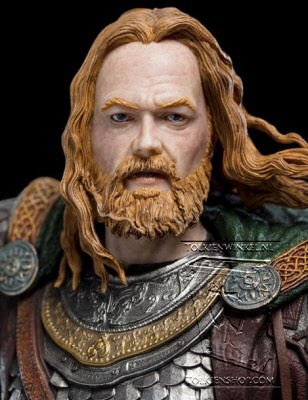 Ailing and in the sway of Gríma Wormtongue, Théoden was not himself. When Wormtongue's men drew blades against the guests and the Wizard advanced upon the undefended king, Gamling was moved to intervene, but his sword was stayed by fellow guard Háma, who perceived Gandalf's true intentions. 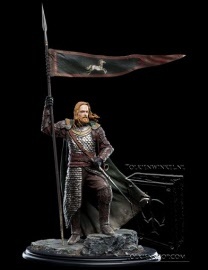 Thanks to the Wizard's help, Théoden and the land of Rohan were both freed from the corrupt counselor's grip. With new purpose, King Théoden rallied the Rohirrim and led them to Helm's Deep, a mighty fortress of stone built into the White Mountains. 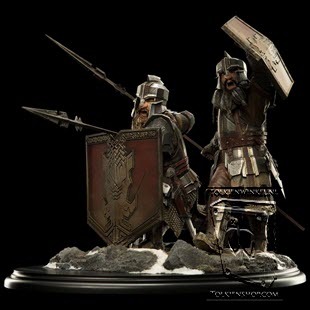 Gamling rode with his king and fought ever at his side, surviving both the perilous journey to the Deep and the fearsome siege brought against them there by the fallen Wizard Saruman. Gamling is brought to you by sculptor Gary Hunt, an accomplished artist who is one of Weta Workshop's longest-serving crew members, being part of the original Lord of the Rings crew.